I just love when my flowers start blooming in front of our little shed. 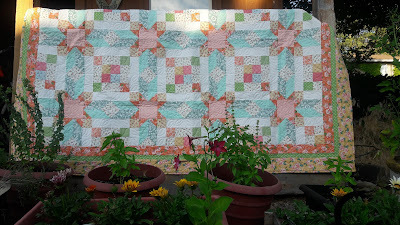 It makes for such a lovely place to photograph quilts. How appropriate that this one is called Summertime. I used the beautiful line, Sugar Pie by Lella Boutique for Moda. The blues remind me of summer skies while the peaches remind me of my apricots and peaches, true symbols of summer. and flowers, more signs of summer. I'm loving this summertime finish. You can find the pattern in the July/August issue of Love of Quilting, along with several other perfect for summer quilts. Speaking of summer Anna and I will be doing the Salt Lake City Downtown Farmer's market again next week. Now that we have one under out belt we are less nervous for this one. That and we received this wonderful text from Michelle, one of our customers from the last market. She said, "I just wanted to tell you, me and two of my daughters who struggle with blemishes have been using your Blemish Buster. We LOVE it? We started seeing huge improvements within the first two days. I'm happy we found your product and I'll keep buying it as long as you keep making it." This made me feel so good. I knew it worked for my son and daughter but it was nice to know that it worked for others as well. Michelle bought us out of our Blemish Buster soap but I've made more. You can find it and the rest of our all natural skin loving soap in our Etsy Shop. Gorgeous quilt! Is that your pattern in the magazine? 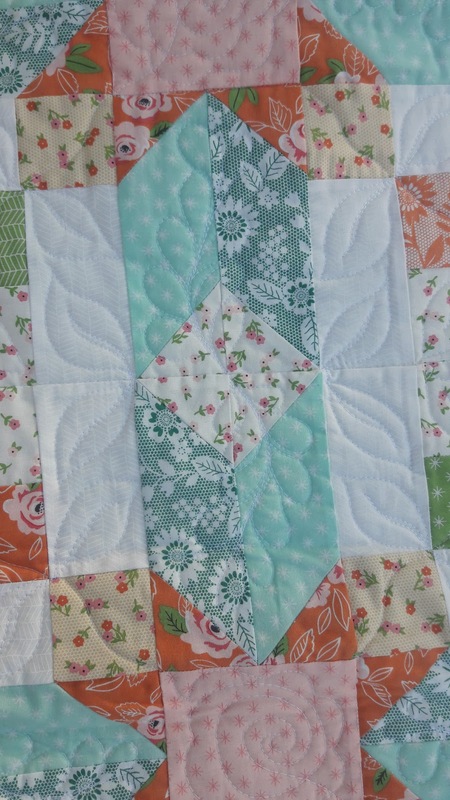 Love your quilted flowers, feathers and leaves. They are so quaint on this quilt. 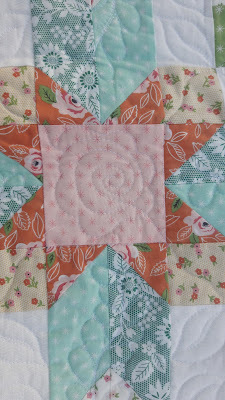 wonderful quilt - I love my homemade soap - I would be a mess without it. That is one lovely quilt! The colors are so soft and inviting for summer - well done! 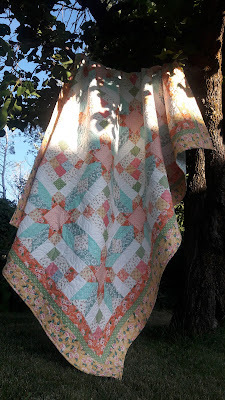 Your summertime quilt is just gorgeous, love those Sugar Pie colours. Perfect place to photograph. 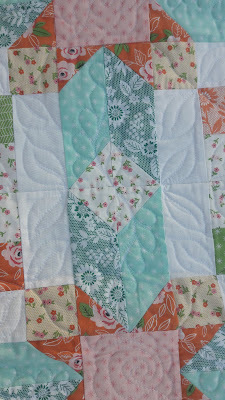 What a beautiful quilt - you're right, it has all the gentle colours of summer in it!